If you are looking for a centerpiece that will fit with almost any wedding theme then candles are a good choice. They sparkle and add a touch of magic to any room plus they are relatively inexpensive (compared to flowers), which is probably one of the main reasons I like them! Whatever type of candle you choose to decorate your tables with you will need to find a base to fit them in. Taper candles need a pot, floating candles need something to float on and tealights need votive holders, otherwise you end up with just the candles on the table! To create a centerpiece worthy of your wedding you will need to add extra decorations to these candle displays which can add to the overall expense if you are not careful. One way to avoid too many extra decorations is to use a lantern centerpiece. That way your centerpiece is one piece that can be transported to your venue relatively easily and then placed carefully on your tables. Lanterns are also great to decorate the aisle, trees or entrance of an outdoor wedding and if your reception is going on into the evening then the lanterns can add extra sparkle to the dance floor area. Rather than buying lots of lanterns you could look at moving them round to where you need them as you need them, you will only need aisle lanterns once and then you can move them to the tables. Using your decorations more than once can really save money. Where you buy your lanterns is also important as the prices vary wildly, avoid home type stores and look to buy in bulk from a wholesaler or in cheap stores in your area. Have a look at all styles of lanterns that you can find; white Moroccan lanterns and paper lanterns are popular for all weddings and then you have the classic lantern for a beach themed wedding. 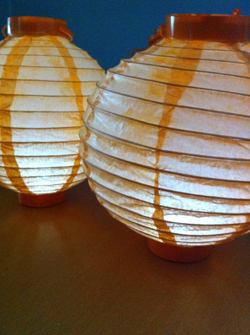 Paper lanterns will obviously need a battery powered light rather than a lit flame. 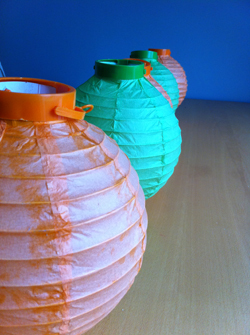 You can make your lanterns your own by tying colored ribbons or weaving ivy around the lantern. I mention ivy as that is considered to be wedded bliss. If your wedding has a very strong theme you should include that into your centerpiece. Dollar stores are a fantastic place to look for decorations and lanterns. These are the lanterns that I bought last month in my local dollar store. Seriously they were $1 each! The metal ones take a tealight and the paper ones come with their own battery powered lights inside the lantern and the price included the batteries! I have used them for one reception so far and the batteries are still going strong! Can you tell I am impressed? Plus you can change the batteries when they run out which I will do before I use them for another reception. When you buy items from dollar or consignment stores it is worth buying just a couple to start with to make sure they are exactly what you want. You may find they are too small when you get them out of the box or the light doesn't shine bright enough. However don't leave it too long before you go back to get the rest that you need as you may find they have sold out. Paper lanterns can be used as centerpieces and if you can't find battery lights for inside you can instead add dried flowers or feathers in the top of the lantern turning it into a funky vase. 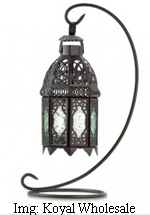 Both lanterns look great lined up along the table and they can also be hung up as traditional lanterns as well. Their color may be a bit bright for your wedding theme so have a look for more subtle colors in your area, that is the downside to buying items from the dollar store they don't always have the colors you want. Don't be put off wholesalers by thinking you won't be able to buy from them because you can and buying 12 lanterns for one price will work out more cost effective than buying them individually. One wholesaler I do recommend for items for your centerpiece is Koyal Wholesale, there is so much choice and the prices are very reasonable. Not as reasonable as the dollar store but at least you get to choose your own colors! Also have a look at Amazon and Ebay as a number of smaller wedding wholesalers sell their stock here. Plus on Ebay you will also find brides selling wedding items that they used for their own wedding, because what else are you going to do with 12 goldfish bowls?! 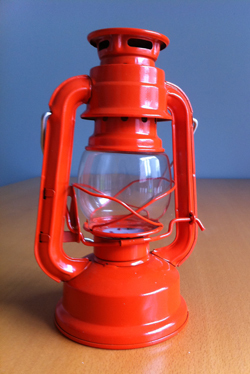 You can also think about making your own lanterns from regular objects, the most obvious being glass jars or even tins. Glass jars can be painted with glass paints or have ribbons and lace tied to them. One Martha Stewart idea is to stick paper doilies to the outside of the jars that way the candle light flickers through the holes in the paper. You can also buy paper bag luminaries that you could paint your initials or your wedding date on to. There are lots to choose from at Luna Bazaar, plus lots of colors too.